The exhibition showcases 33 clocks and their stories. In post-revolutionary Russia, anarchists lead by Nestor Makhno raided Mennonite towns and villages, demanding food and shelter and often looting homes of everything valuable. According to the owners of this clock, the home of Peter Martens was taken over by Makhno to serve as his headquarters. When the clock started to chime, Makhno ripped it off the wall and stamped on it with his boot, leaving a permanent reminder of his terror. Loan courtesy of Mennonite Heritage Archives. Artifacts are objects that are preserved, stored, and exhibited as a part of a museum’s official collection. If you’ll excuse what becomes–in the particular case of clocks–a pun, they are objects upon which time has essentially stopped. When an artifact becomes part of a museum’s collection, the state it’s in upon entering the collection is usually the state in which it’s kept. Of course, preventative conservation measures are put in place to prevent further deterioration and to stabilise the object, but scratches in the paint or dents in metal, for example, are for the most part left as-is. This is because they stand as evidence of an object’s past, as markers of its experience, and they speak to its history in a way that repairing this damage would erase. So, in ‘The Art of Mennonite Clocks’, which is on display at Mennonite Heritage Village (MHV) in Steinbach, Manitoba until April 2019, visitors will see clocks that may be bent, marked, or in some other way no longer in pristine condition. These clocks–half of which come from MHV’s collection of artifacts, the other half on loan from organisations and individuals from the community, most through the Kroeger Clocks Heritage Foundation–bare the marks of their history. A Mandtler clock in the Mennonite Heritage Village’s collection, with scratches of anarchists’ swords marring its face, is a good example of how the imperfections in an object can be more important than restoring it to perfect condition. Artifacts in a museum’s collection also change ownership from individuals to the museum. In coming under the legal ownership of a museum and becoming part of its collection, artifacts receive a certain measure of protection as part of the collection, with environmental and care restrictions placed on them, while becoming accessible to the public in a way they wouldn’t if they remained in private homes. On the other hand, objects kept in people’s homes continue to accumulate a history. They continue to have a life of their own. The clocks loaned from the community for ‘The Art of Mennonite Clocks’ are part of the life in the houses from which they came, part of the story of their owners’ lives. These living objects don’t have the restrictions placed on them that the artifacts in museum collections do and they may be repaired, painted over, or otherwise altered–sometimes for better and sometimes perhaps not. ‘The Art of Mennonite Clocks’ contains wonderful examples of beautiful clocks, but it also presents examples of more debatable restoration choices. Even being a part of an exhibition becomes a part of the history of a living object in a way that’s different from an artifact held in a museum collection. Mennonite wall clocks are artifacts with full and rich histories. Museums such as Mennonite Heritage Village and the artifacts in its collection, and organisations such as the Kroeger Clocks Heritage Foundation, with the stories and visual records it collects for its virtual collection, share a role in helping to preserve this history. Exhibitions such as ‘The Art of Mennonite Clocks’ help to preserve the history of these unique objects, highlighting the role they’ve played in the span of Mennonite history, while presenting them as works of art, inside and out, in their own right. But there is still much more research to be done. The hope is that ‘The Art of Mennonite Clocks’ exhibition will spur on increased interest in the clocks themselves as well research into the material and social history surrounding them and their various makers. View the beautiful art featured in three Kroeger clocks below. 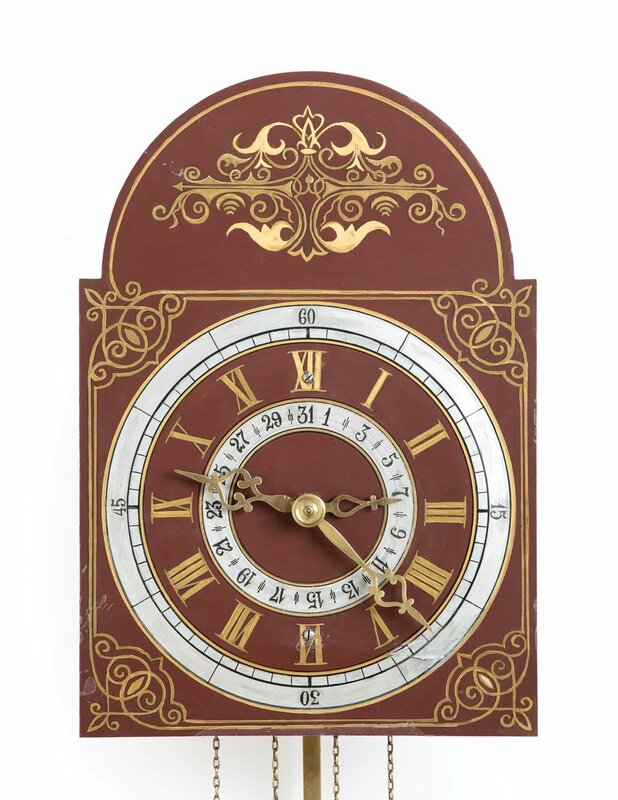 The floral motif became a common feature on Kroeger clocks in the late nineteenth century. Suderman Clock Mennonite homes were filled with the sounds of the wall clock. This clock hung in the dining room of Annie Suderman’s farmhouse. It was the children’s responsibility to wind the clock each day. At night, the ticking of the clock was heard throughout the house and chimes rang out every hour. 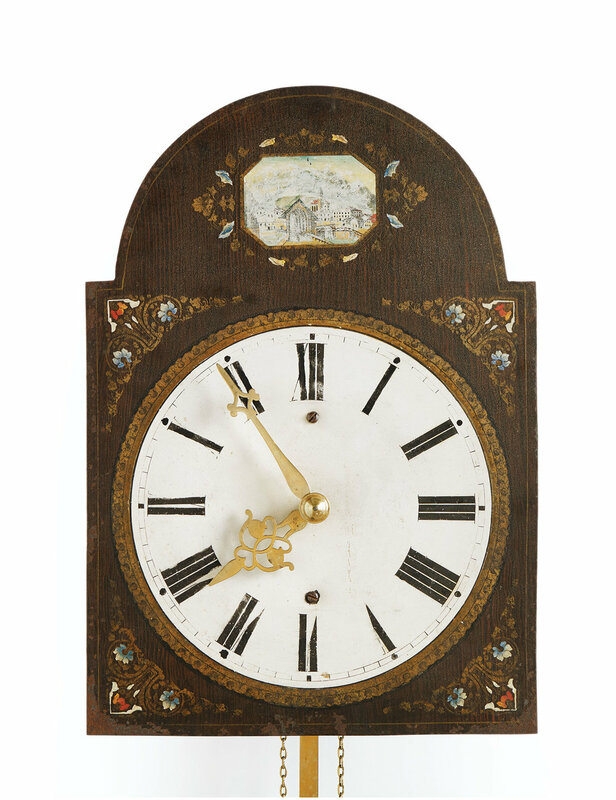 The floral motif became a common feature on Kroeger clocks in the late nineteenth century. These floral images were likely inspired by the popular artistic movements of the time period, such as the Art Nouveau style of the 1890s. The floral motif, highlighted above, became a common feature on Kroeger clocks in the late nineteenth century. This clock face is unique, painted a deep brown with detailing that appears to imitate a wood grain. Cityscape Mandtler This Mandtler clock face is unique. It is painted a deep brown and has detailing that appears to imitate a wood grain. While this was a technique sometimes used on traditional Mennonite furniture, it was not commonly used on clocks. It also features a city scene, either real or imagined, in the arch where most Mennonite wall clocks focused on floral or nature scenes. While other clock makers switched to decals for arch designs the Mandtlers continued to hand paint the clock face. Lilac Mandtler Compared to others in this exhibit, Mandtler-made clocks are easy to identify. The clocks tend to have larger and squarer faces than others, and are typically painted darker colours. Additionally, while other clockmakers switched to decals for arch designs the Mandtlers continued to hand paint the clock face. In the industrial period, they continued to hand paint this feature. The inside mechanism of this clock features Gerhard Mandtler’s signature. Eight clocks from the 2018 exhibition “The Art of Mennonite Clocks” are featured in detail below. This clock’s round dial and simple, rope-driven movement originated in Prussia in the eighteenth century. Mennonite clockmakers continued to make this kind of dial in Russia up to the 1840s. Abraham Kroeger (1791–1872) likely made this clock in Rosenthal around 1815. Abraham’s father, Johann (1754–1823), had taught the clockmaking trade to his sons in Prussia, and continued the practice after the family moved to Russia (now Ukraine) in 1803. As was the practice in Prussia, the Kroegers did not mark their clocks. Arthur Kroeger remade the dial according to designs originally painted by the Kroegers. The motif of a vase filled with flowers is a common one found in Mennonite fraktur (folk art). The Mandtlers, like the Kroegers, had a clockmaking tradition going back to the eighteenth century. Gerhard Mandtler (1821–1904), who made this clock in 1865, was at least a fifth-generation clockmaker. His father, Jacob (ca. 1790–after 1840), moved the family from Prussia to the Molotschna Colony in 1839 and set up a clockmaking workshop in Lindenau. The dial of this clock is original. The dial is painted in a wood grain pattern, which was unique for Mennonite clocks, but common in Mennonite-made furniture. This clock has a green dial that is more typical of Mandtler clocks. Even though it was made later than Mandtler Clock MC0217, it has only one hand and therefore a simpler movement. Mennonite clocks did not follow a linear progression from simple to more complex. Mennonite clockmakers continued to make one-handed clocks not because they weren't able to make more complex clocks, but because simpler clocks were more affordable. In a society where industrialisation was just getting underway in 1870, knowing the exact minute of the day was not crucial. Made only a year after Mandtler clock MC0220, this clock tells the minute, chimes the hour, and tracks the date. It was made by Kornelius Hildebrand (1833–1920), who learned his trade under clockmakers Peter Lepp (1817–1871) and Gerhard Hamm (ca. 1818–1866). Hildebrand completed his apprenticeship in 1854 and proceeded to make clocks for almost 25 years. In 1878 Hildebrand embarked on a second career and, like Peter Lepp, went into the farm machinery business. Hildebrand did not abandon clockmaking completely, however; he made a clock for each of his children when they married. Little is known about Gerhard Hamm (ca. 1818–1866) other than that he was a clockmaker who worked with Peter Lepp (1817–1871) and helped train Kornelius Hildebrand (1833–1920). As he seems not to have passed on the trade to one of his children and died young, there are few surviving Hamm clocks. Gerhard Hamm marked the hour wheels of his clocks, including this one, with his initials and the year they were made. The dial was repainted in 1952. This clock was made during the peak period of Kroeger clock manufacture, 1890 to 1910. It was commissioned by a wealthy Mennonite factory owner, indicative of the continued economic prosperity for some, and would have been one of the most expensive models the Kroegers made. By this time, the Kroegers had started using serial numbers as well. Though not an unusual design, this is not a typical one; most Kroeger clocks of this period had lighter dials with floral decals. This clock is also significant because it belonged to Arthur Kroeger’s maternal grandparents, and it was the first clock that he restored, repaired, and repainted. David Kroeger (1829–1909) made this clock around the time that the Mennonite colonies in Russia (now Ukraine) were undergoing an economic boom. More Mennonites now had a greater need for––and could afford––clocks that told both the hour and the minute. Increased demand also meant that Mennonite clockmakers were starting to industrialise. This clock has the hallmarks of later Kroeger clocks: the movement is more modern, it uses a chain drive instead of the more traditional rope drive, and the dished-out chapter ring, which enabled the dial to be thinner, was now standard. However, the Kroegers only started to use serial numbers the year after this was made and still painted their dials by hand. The Kroegers were not the only ones to mass-produce clocks. The second Gerhard Mandtler (1855–1930) built his own factory in Lindenau, which was held in much the same esteem as the Kroeger factory at the beginning of the twentieth century. The Mandtlers also seem to have standardised their clocks by this time, as this design is typical of later Mandtler dials. They used decals for their spandrels, but continued to hand-paint their arch designs and kept their dials flat. The Kroegers and Mandtlers must have used the same source for decals, as the decals on this clock are also found on Kroeger clocks. The Mandtlers ceased manufacturing clocks around the time of the Russian Revolution (1918–1921). Gerhard Mandtler was the last Mandtler clockmaker.